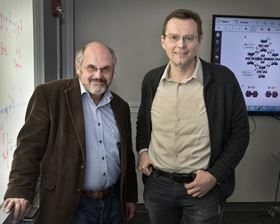 Brookhaven Lab theoretical physicist Alexei Tsvelik (left) and physicist Igor Zaliznyak (right), with the crystal structure of the studied metallic material shown on the screen in the background. Photo: Brookhaven National Laboratory. Some three-dimensional materials can exhibit exotic properties that only exist in ‘lower’ dimensions. In the one-dimensional chains of atoms that exist within a bulk sample, for example, electrons can separate into three distinct entities, each carrying information about just one aspect of the electron's identity – its spin, charge or orbit. The spinon, the entity that carries information about electron spin, has been known to control magnetism in certain insulating materials whose electron spins can point in any direction and easily flip direction. Now, a new study published in Science reports a metallic material in which the orbital movement of electrons around the atomic nucleus, rather than electron spin, is the driving force behind the material's strong magnetism. "In this bulk metallic compound, we unexpectedly found one-dimensional magnetic excitations that are typical of insulating materials whose main source of magnetism is the spin of its electrons," said physicist Igor Zaliznyak, who led the research at the US Department of Energy's (DOE) Brookhaven National Laboratory. "Our new understanding of how spinons contribute to the magnetism of an orbital-dominated system could potentially lead to the development of technologies that make use of orbital magnetism – for example, quantum computing components such as magnetic data processing and storage devices." The experimental team included Brookhaven Lab and Stony Brook University physicists Meigan Aronson and William Gannon (both now at Texas A&M University) and Liusuo Wu (now at DOE's Oak Ridge National Laboratory). Nearly 10 years ago, these researchers pioneered the study of a metallic compound made of ytterbium, platinum and lead (Yb2Pt2Pb). In this latest study, they used magnetic neutron scattering, a technique in which a beam of neutrons is directed at a magnetic material to probe its microscopic magnetism on an atomic scale. The magnetic moments of the neutrons in the beam interact with the magnetic moments of the material, causing the neutrons to scatter. Measuring the intensity of these scattered neutrons as a function of the momentum and energy transferred to the material produces a spectrum that reveals the dispersion and magnitude of magnetic excitations in the material. At low energies (up to 2 milli electron volts) and low temperatures (below 100K), the experiments revealed a broad continuum of magnetic excitations moving in one direction. The experimental team compared these measurements with theoretical predictions of what should be observed for spinons, as calculated by theoretical physicists Alexei Tsvelik at Brookhaven Lab and Jean-Sebastian Caux and Michael Brockmann at the University of Amsterdam. The dispersion of magnetic excitations obtained experimentally and theoretically was in close agreement, despite the magnetic moments of the Yb atoms being four times larger than what would be expected from a spin-dominated system. "Our measurements provide direct evidence that this compound contains isolated chains where spinons are at work. But the large size of the magnetic moments makes it clear that orbital motion, not spin, is the dominant mechanism for magnetism," said Zaliznyak. The paper in Science contains details of how the scientists characterized the direction of the magnetic fluctuations and developed a model to describe the compound's behavior. They used their model to compute an approximate magnetic excitation spectrum that they compared with experimental observations, confirming that spinons are involved in the magnetic dynamics in Yb2Pt2Pb. The scientists also came up with an explanation for how magnetic excitations occur in the Yb atoms: instead of the electronic magnetic moments flipping direction as they would in a spin-based system, electrons hop between overlapping orbitals on adjacent Yb atoms. Both mechanisms – flipping and hopping – change the total energy of the system and lead to similar magnetic fluctuations along the chains of atoms. "There is strong coupling between spin and orbital motion. The orbital alignment is rigidly determined by electric fields generated by nearby Pb and Pt atoms. Although the Yb atoms cannot flip their magnetic moments, they can exchange their electrons via orbital overlap," Zaliznyak said. During these orbital exchanges, the electrons are stripped of their orbital ‘identity’, allowing electron charges to move independently of the electron orbital motion around the Yb atom's nucleus – a phenomenon that Zaliznyak and his team call charge-orbital separation. Scientists have already demonstrated the other two mechanisms of the three-part electron identity "splitting" – namely, spin-charge separation and spin-orbital separation. "This research completes the triad of electron fractionalization phenomena," Zaliznyak said.